Elaine Riordan was born in Ireland in 1971. She works predominantly in the medium of clay, but also explores photography, metal and concrete in her artistic practice. The emphasis of her current body of work has developed from years of investigations into scale, form, texture and how these elements relate to her experience of space as contained and enhanced by architectural structure. She works primarily with porcelain paper clay, as it is the form of expression that best encapsulates her concepts. The sculptural pieces that Riordan creates unify her concerns for space, its containment/release and also represent her personal response to life, travel, cities, art, and ceramics. Riordan completed a Masters in Ceramic Design at the National College of Art & Design in 2007 and a Bachelors of Design at Limerick School of Art & Design in 2002 where she developed her sculptural practice. Between 2002-2004 she trained as a potter on the Design & Crafts Council of Ireland Pottery Skills & Design Course in Thomastown. Jingdezhen, China. In 2011 she was selected for and completed a residency in Fuping China to establish the Irish Pavillion as part of the Fule International Ceramic Museum Complex. In the summer of 2015 she travelled to the USA/Canada visiting: Medalta, Medicine Hat, Alberta, Canada to give a talk on Irish Ceramics, Andersons Ranch Arts Centre – Colorado, the Archie Bray Foundation and Red lodge Clay Centre – Montana. In 2016 she will travel to Red Lodge Clay Centre for a AIA Residency. Riordan has been the Chairperson of Ceramics Ireland since 2009. Ceramics Ireland is an organisation of approx. 200 members throughout Ireland. In her capacity as Chair she organizes workshops, exhibitions and other fundraising activities annually along with coordinating the 3-day biennial International Ceramics Festival. She was elected as a Director of the Design and Crafts Council of Ireland in 2014. She was appointed as National Commissioner (Ireland) for European Ceramic Context 2014. Riordan was also a member of the Local Organising Committee for the IAC 46th General Assembly in Dublin, 2014. She is represented in: the National Collection of Ireland, Collins Barracks, Dublin; in the Design & Crafts Council of Ireland Collection; the Irish Museum at the FuLe International Ceramic Museum Complex, Fuping, China; Dao Clay Gallery, Xian and in several Corporate and Private collections. Elaine lives and works in Limerick, Ireland. The emphasis of my ceramic work has developed from years of investigations into scale, form, texture and how these elements related to my experience of space as contained and enhanced by architectural structure. Working with terra cotta for this new body of work represents a departure from my preferred porcelain paper clay. These sculptural pieces that I make unify my concerns for space, its containment/release and they also represent my personal response to life, travel, cities, art, and ceramics. This new work is derived from investigations into rural landscape and vernacular architecture. It seeks to explore the dichotomies of positive /negative space, large/small scale, strength/weakness, soft/sharp, inside/outside, presence/absence and urban/rural. There is a certain ambiguity of scale in the ceramic sculptures I make. Such an ambiguity can lead to a disruption in the perception of the spectator as to the space occupied by the sculpture, themselves and the architecture surrounding them. 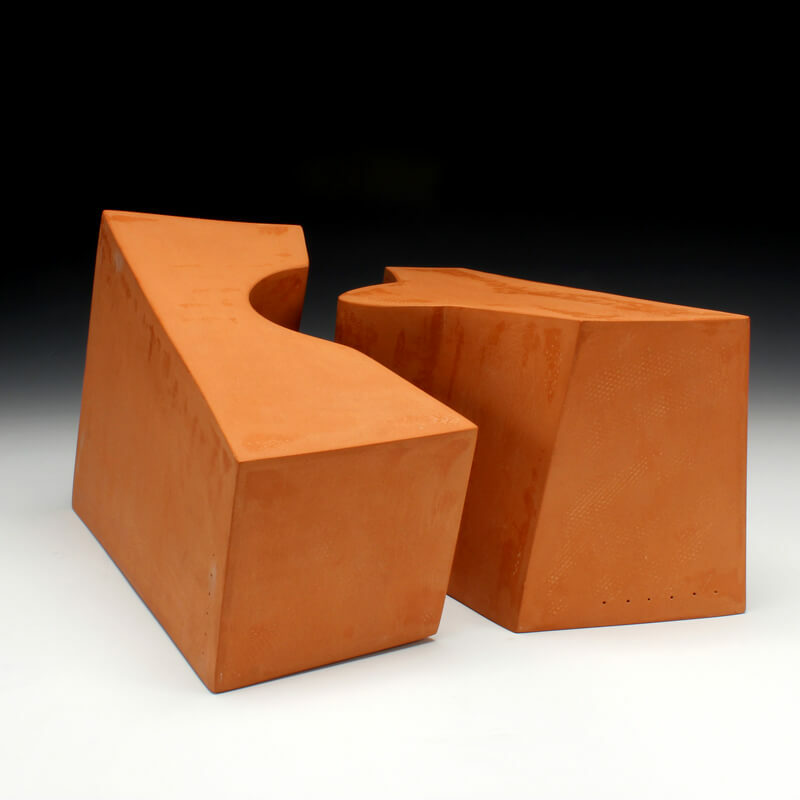 Ultimately what results are ceramic sculptures that act as spaces that have the power to transport us, the viewer, visually or mentally to experience space, thereby facilitating the exchange between architecture and ceramic art.